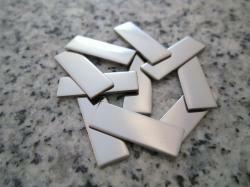 1/4" x 3/4" (6MM x 19MM) Rectanlge Stamping Blank, 22g Stainless Steel - AWESOME Silver Alternative! Using our very shiny stainless steel blanks will allow you to offer your customers products that are beautiful & very affordable. For many years luxury watchmakers have appreciated that stainless steel is an excellent choice for producing quality jewelry. It is hypo allergenic, does not rust, change color or tarnish. And because it is so durable, items crafted with it can be treasured for a lifetime. 1. Our blanks ship with an easy to peel vinyl film to protect the shiny side until you are ready to use them and are made in the USA. 3. Stainless steel is a very strong durable metal and does not easily bend, which are very desirable qualities. However punch hole pliers & screw down punches will not work. The heavy duty punches I have listed are modified so the hole can be set to 1/16" from the blank edge (orig. only 1/4" min.) & the pin opening is coated to prevent marring the blank. Hole punching is quick & easy in stainless steel & whatever other metal you're using.